Arguably the most historic hotel in Germany, The Elephant dates back to 1542. Indeed, by the late 1600‘s it was regarded as being at the centre of social and cultural Weimar. 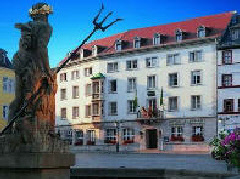 Located on the old market square, the building temporarily closed for extensive restoration in the early 1990‘s, ultimately reopening as a luxurious five-star hotel. Today it boasts almost one hundred guest rooms and features a restaurant specializing in Thuringian cuisine. Its suites are individually named and include the Gropius, the Lyonel Feininger, Thomas Mann, Lilli Palmer, and the Harry Graf Kessler. Goethe, Liszt, Bach and Leo Tolstoy are among the hotel’s famous artistic former guests, while it is also said to have played host to Adolf Hitler, Karl Marx, and Nietzsche. Indeed, few places can claim such a diverse array of notable past visitors. A truly iconic hotel in every sense.